Crystal-clear video calls while outdoors, streaming high-definition videos with almost no buffering time and driverless cars finally becoming a reality - these are some of the things the next evolution of mobile networks, commonly known as 5G, could enable in the near future. And Singapore has started its journey towards 5G, with telecommunication regulator Infocomm Media Development Authority announcing last week that it is holding a public consultation later this year on the technological and spectrum requirements for 5G. 5G networks are the successor to current 4G networks, offering upgrades in three areas: faster download speeds, lower latency and higher capacity. 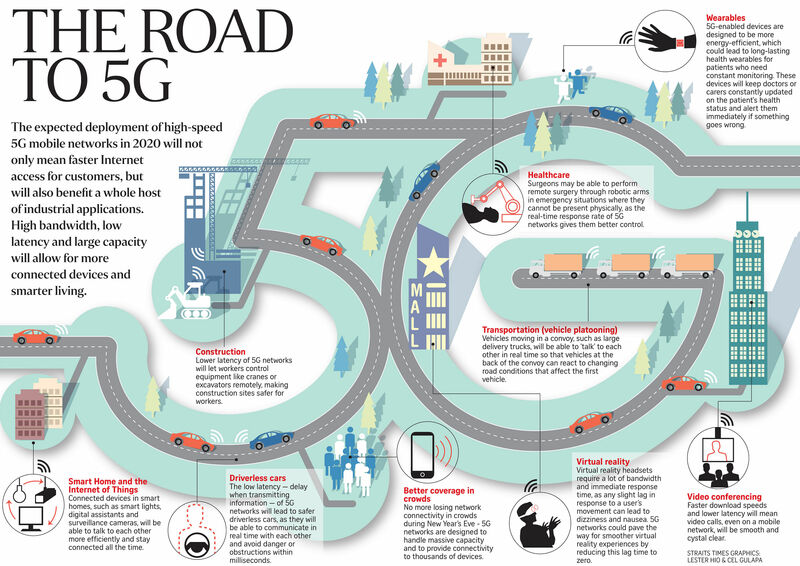 The Republic is well on the road towards 5G, as regulators, telcos and and companies here are already conducting trials and live tests of the technology, almost three years before the network is expected to be rolled out in 2020. Besides the consumer benefits of faster Internet speeds, 5G will also have tremendous industrial applications in areas such as transport, healthcare and robotics. Speed-wise, 5G networks will have download speeds exceeding 1Gbps. Currently, peak 4G speeds are between 100Mbps and 1Gbps. But telcos here are now bridging the gap towards 1Gbps. Singtel announced two weeks ago that it had upgraded its mobile network across the island, bringing its top surfing speed to 450Mbps. The current standard shared by all three telcos peaked at 300Mbps previously. Mr Yuen Kuan Moon, chief executive officer of Singtel's consumer Singapore unit, said: "Our early trials have been very successful and this proves that we are on the right track to achieving 5G's ultra-fast speeds and low latency." 5G networks will also be designed for ultra-low latency of less than 1ms, which means little to almost no delay in transmitting information. Telecommunications company Ericsson showed last week at Singtel's Next Generation Mobile Network forum a robotic arm controlled remotely with near-surgical precision, demonstrating 5G networks' capability of near-instantaneous response time. "This would be critical in cases such as in medicine, where doctors may provide remote assistance to patients with the help of robots," said Mr Raymond Soh, vice-president of network products for Ericsson Singapore and Brunei. 5G networks will also have high capacity. Mr Nicolas Bouverot, head of Asia South at Finnish communications firm Nokia, said the networks will have the ability to handle billions of devices. "This means that the mobile network will not only be able to connect humans but also a huge number of machines and sensors," he said. "5G will bring the Internet of Things to full realisation." However, this vision of the futureis dependent on the final standards set for 5G, which are expected to be set by the International Telecommunications Union and the 3GPP by 2020. These standards will follow from the agenda of the World Radiocommunication Conference in 2019, where 5G spectrum allocations will be discussed. But Singapore telcos are already collaborating with companies to test how commercial 5G can best be deployed. Last week, M1 announced that it successfully hit a peak transmission speed of 35Gbps at a trial with Chinese telecoms firm Huawei at its main operating centre in Jurong. "We are looking at different technology options to get very high speeds, and will continue to do trials that help us as we go forward between now and commercial 5G," said M1 chief operating officer Patrick Scodeller. Meanwhile, StarHub is working with Huawei and Finnish communications firm Nokia on 5G trials. "We are testing how huge improvements in bandwidth and latency can enable useful applications in augmented reality, e-health, Internet of Things and autonomous driving," said a StarHub spokesman.